The varsity golf team captured second-place honors in the Bowdoin College Invitational golf tournament, played at Brunswick Golf Club in Maine. The tournament was played over two days, Sept. 10 and 11, and the field included nine other schools. 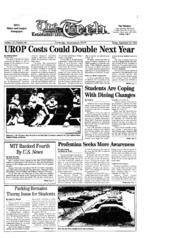 The best four scores from each team were added up on each day, and MIT was beaten by Merrimack College by a margin of only one stroke, 636 to 637. Nevertheless, it was a solid performance from the relatively young team, which lost a couple of fine players this year. Individual scores were: Tom Kawamoto '96 (77-79-156), Scott McDavid '97 (81-77-158), Brian Schuler '96 (79-81-160), Frank Popp '94 (81-82-163), and Mike Leabman '96 (84-86-170). The Engineers bounced back after losing the heartbreaker in Maine by winning their first two matches. Matches were played with a slightly different format, counting the best five scores from each team. On Sept. 14, MIT beat Bentley College, 422 to 457, at Crystal Springs Country Club in Haverhill. Scoring was difficult because the players were not allowed on the back nine and had to play the treacherous front nine twice. Individual scores were: Kawamoto (78), Leabman (81), McDavid (87), Popp (88), and Schuler (88). The next day, MIT returned to Crystal Springs and beat Boston University, 407 to 423. Kawamoto and Leabman led the team with a pair of 79's, followed by Popp (81), McDavid (83), and Schuler (85).